New season roots make this salad so much sweeter than it would be in the autumn. Gently roasting them intensifies their character and caramlises their sugary qualities. Cut the tops off the carrots (I like to leave a couple of cm’s on) and twist or cut the tops from the little beetroot. Scrub them both under a cold running tap. Half the carrots from top to bottom, if they are big, half or quarter the beetroot too. Scatter out the roots over a large roasting tray. Trickle with half the olive oil, tear over the bay leaves and the marjoram and sprinkle over the lemon zest. Season everything well with salt and pepper. Roast the veg for about 45 – 50 minutes or until the beetroot are nice and tender and the carrots are caramalised and soft. Meanwhile make the dressing. Combine the yoghurt with the lemon juice, remaining olive oil, the toasted fennel seeds, chilli flakes and 1 Tbls of honey. Mix well. 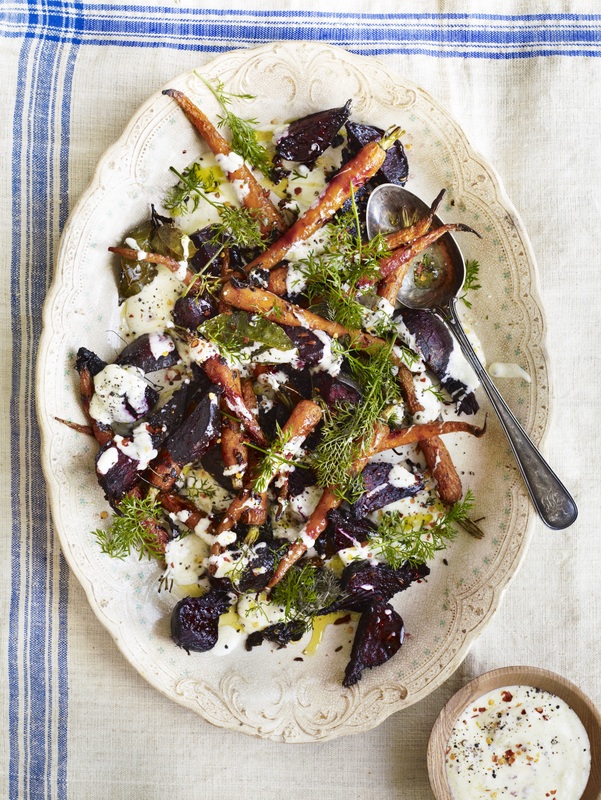 Arrange the roasted roots over a large plate or platter and spoon over the yoghurt dressing. Finish with a scattering of fennel tops if using, the remaining honey and a trickle more olive oil.